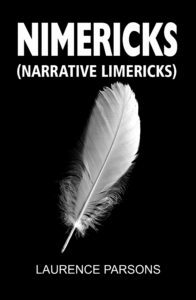 Nimericks (Narrative Limericks) by Laurence Parsons–From the nation of Imagi come these stories to inform, to uplift and to entertain. Laurence Parsons was born September 1, 1942, in Phoenix, Arizona. His father was a sign-and-house painter and his mother a housewife. Laurence’s boyhood dreams to become an archaeologist fell by the wayside when he, at twelve, became smitten by the magic bug. During his teens he practised sleight-of-hand and, after three years of active duty in the US Army, he became a professional magician in 1964. He and his German-born wife and assistant, Heidi, performed their magic acts in nightclubs, casinos and TV shows in many countries. Their credits included The London Savoy Hotel, the Casino Monte Carlo, the New Latin Quarter in Tokyo and numerous performances for dignitaries including the ex-King and Queen of Greece and the Shah of Iran (when American/Iranian relations were still good!). After a divorce in 1982, Laurence continued show business activities as solo magician and also as cruise director with various lines where he was able to put his languages—English, German, French and Italian — to good use. In 2006 a domestic situation required his physical presence in Starnberg, Bavaria, and he used his free time during the next six years to write the verses he calls nimericks.